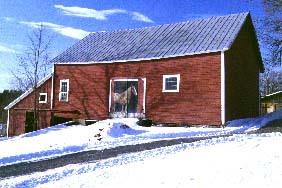 The traditional red and ochre paints found on many barns became widely available in Vermont by about 1850. Made with locally produced iron oxide earth pigments and linseed oil, the paints were relatively inexpensive, and it became fashionable on farms throughout the region to have a red barn contrasting with the white farmhouse. At the end of the century, shingled barns stained dark green or brown became fashionable on gentlemen's farms. In the twentieth century, red, white, and yellow have been the colors of choice of most farmers, often with the trim in a different color.